How do logistics costs impact on the price of the product? Is the warehouse too small? Is there not enough room for goods? Why a new line produces less than it should?Why are we always late with deliveries? These are questions that can be answered by Vistra, solving most of your logistical and organizational problems. Vistra, thanks to international experience gained over the years, is able to intervene in a transversal way on processes, highlighting gaps and inefficiencies by monitoring logistics costs and proposing solutions: technical , structural and organizational, optimized for each customer. With Vistra method logistics projects are developed in cooperation with companies: the project manager manages an integrated team including customer resources, facilitating the transfer of methods and knowledge. Logistics master plan design to support growth / contraction of business. Audit on internal and suppliers logistics. Development of concepts for storage systems. 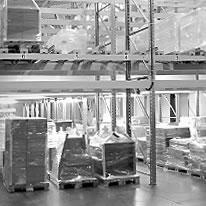 Planning of systems and equipment for material handling. Optimization of internal and external logistics.